← Hercules Farnese of Perge and . . . . This past year the Turks and the Japanese completed an underground tunnel though which the “underground/metro” runs from Europe to Asia and back. The tunnel is about 8.5 miles long and there are two lanes. It costs about $1.20 one way. Today Mary and I visited the Yenikapi Station (on the European side) where some artifacts that were discovered during the excavation are on display. View of the Yenikapi Marmaray Metro Station. Click on Images to Enlarge and/or Download. From left to right, a display with a wonderful video describing the building of the complex project. Left of center one of the ships discovered in the excavations (see below). And in the distance, far right, a small display of some objects found in the excavation. 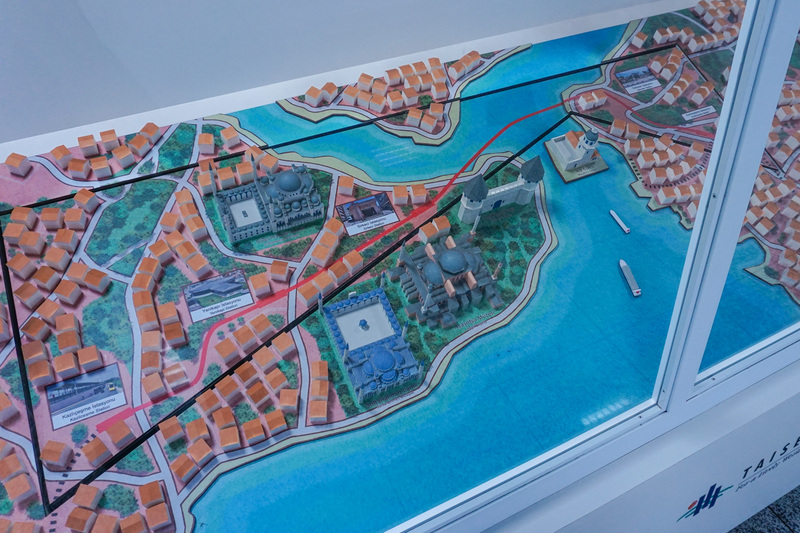 A model of the route of the Marmaray Underground. On the right side of the image is the Bosporus—the boats are heading north and will turn right on their way to the Black Sea. Not drawn to scale. The red solid line running from lower left to the upper right of the picture is the route of the Marmaray Underground. Four stations along the route are marked in the text boxes—three on the European side and one on the Asian side (right) of the Bosporus. 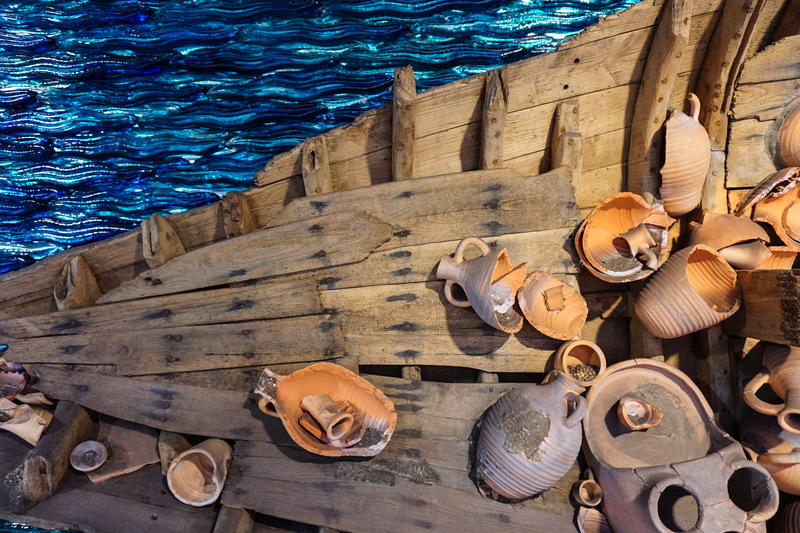 A Ninth Century A.D. vessel that was found during the excavations of the Theodotian Harbor. This boat is about 21 feet (7 m. ) long. Evidently it sunk before leaving the harbor and its cargo vessels are pretty much intact. It looks like the vessels are all of the same type. I have not read any excavation reports on the subject, but I wonder if this ship was ferrying something out to a larger ship—water? Wine? or?? The harbor was built by Theodosius I (ruled A.D. 379–395) and was in use through the eleventh century. Detail of the ship’s construction. Note the use of wooden pegs to fasten the wood pieces together. 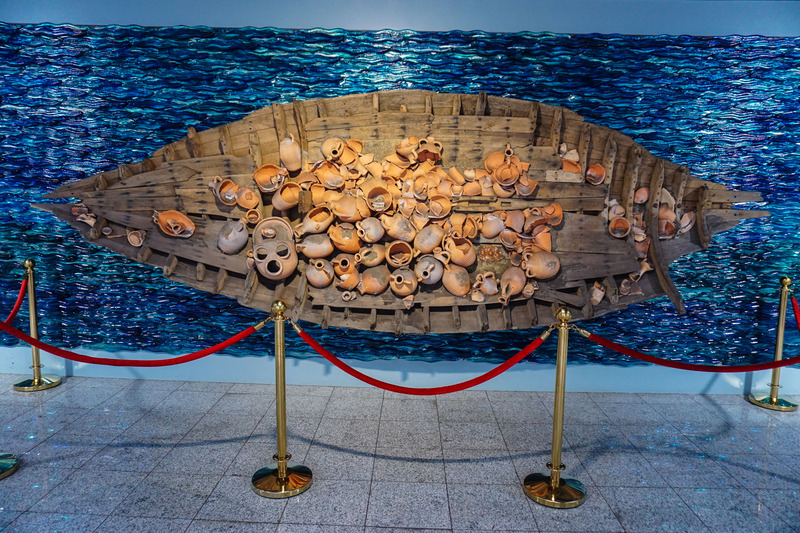 This entry was posted in Places in Turkey and tagged Ancient Ship, Marmaray Tunnel, Theodotius I, Yenikapi Station. Bookmark the permalink.